The Dorin saga continues with this second part where we will discover a certain logic in the development of this brand. It is linked to two aspects: the constraints of use at the time through travel and theatre troupes and the democratisation of make-up, from an elite close to the Court to an emerging bourgeoisie. Through this very inspiring story, we will discover that already at this time, all parts of the body are taken care of, from the hair through the nails, the hands, the legs… with a very important concern to adapt to the way of life. And this is true for both women and men. Through the history of one of the oldest make-up houses, we already understand to what extent the development of cosmetic products has been guided by usage, after the excesses of the Court of Versailles. At that time, it was customary for only the elegant to use subterfuges to enhance their physical appearance. Artifice and grotesque prevailed. The word make-up was born with a pejorative meaning of"cheating". At the beginning of the 18th century, under the reign of Louis XIV, blush was a coquetterie. It is made from sheep fat and various flower waters as well as talcum powder. The ceruse (lead oxide), very toxic product, is widely used to whiten the face, neck, arms… The important thing was to have the skin as white as possible, symbol of virginity and purity. It can also hide all stains, scars, redness, couperoses… The aesthetic is then queen. The king is stuffed with red and pink, flies land, and men follow. The wigs are powdered to excess with bone powder, and iris roots and make-up is declined over the whole body. The color red is obsessive, present everywhere (even on the cheeks of the dead) because it symbolizes youth and sensuality. It is the great period of shadows and powders and the Dorin house will offer a whole palette of colours to the greats of this world. The period of the encyclopedists with Diderot began a turning point by denouncing all these artifices. Rousseau will amplify this trend by praising a natural and healthy body. Finally, the Revolution will definitely bring down the Ancien Régime and, with it, a whole world of outrageous appearance. Then hygiene appears and habits change. Make-up is reborn in comedians and demi-mondaines. Dorin's makeup has stood the test of time. 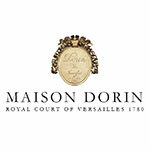 The products of the Dorin brand have evolved with the uses of theatre troupes over the years. These being mobile, it was necessary to adapt the formulas and especially the containers. As Hadi Nasri, the owner of the Dorin brand, explains," Initially designed as a paste cast in porcelain cases, the lipstick will be transformed into a stick, easy to carry, with a more contemporary aesthetic. It is packaged in slightly flexible metal cylinders (iron or tin), or even semi-rigid metallic paper. ". These"pocket" reds the size of a lighter, about 4 cm long, are available in several shades such as electric red, bright red, dark red… and are numbered according to shades (the collection extends to No. 17, which suggests the existence of at least 17 shades). It is also the time of the caskets, these metal boxes associating a powder with a lipstick (beginning of the 20 e century). As early as 1930, the influence of metalwork was felt with a certain graphic effervescence that was to be found in make-up works. Lipstick has been such an emblematic product of the brand that in the United States, it has become common parlance. So,"give me a Dorine" meant"Give me a lipstick". At that time, everything that made lips red was called Deram (de Dorin). In 1927, Rouge Baiser was the first lipstick to resist everything, even kissing…Audrey Hepburn made it her favourite product. It is democratizing and many brands propose ranges declined around the red, work new concepts (two in one; 1929). In all forms, free or compact, of all shades, for the body, face, legs…, Dorin powders are of all uses. " In the United States, a whole range of powders with different fruit flavours such as raspberry, strawberry make up the"La Dorine" range. . These powders will then be marketed again in France. They are packed in small wooden boxes. At Dorin, there is also an exclusivity: the shaker box containing four powder shades. It was possible to mix the different shades at his convenience. It was already customization of colors according to his complexion! This shows the brand's avant-gardism. These powders were rice powders from various regions such as Alsace, Lorraine or, more exotic, Iraq, Egypt. The names are already evocative: Nile powder, Mosul rose… and the slogan strongly selling:"… Dorin exists in every store in the world; if you find a store without Dorin products, let us know and we'll give you a gift. …"
Compact or fluid, Dorin powders are used for body, face and hands. Those for the legs are specific and present themselves as a painter's palette of different colors. They bring a"silk stockings" aspect. The black pencil which accompanies the powder makes it possible to trace the seam along the leg. This powder, called Bas de Soie, exists in 3 shades: one for jogging, one for the city and one for sport. This leg powder is resistant to sweat, coat rubbing and water. Here we find the concern to take into account the use and context of use of products. Hand powders are also very white rice powders. " In total, there are a hundred references of colors, it is a gigantic palette for the time" . At the end of the 19th century, make-up came in three colours: white, red and other colours for the circus world. The chalky sticks to colour the noses of clowns, as well as their make-up were made from Dorin make-up. Around 1930, make-up was dedicated to the world of travel. We find the same term as powders, with Alsace red, Nile red, Mosul red… The boxes are cardboard or metal for transport. The decoration work on the cases is already very elaborate with universes that may seem outdated to us. Today, these codes are used to evoke the Flowers or romantic trend. This retrospective towards one of the oldest make-up houses reminds us that innovation was already very present and incontestably turned towards use, without forgetting the aestheticism of the decorations. Michelle graduated from ENSAM Montpellier (today SupAgro) in food sciences and started her career as Quality Engineer in the Intermarché group. During this first experience, she rubs shoulders with SMEs and upstream sectors of the agri-food industry. In 1993, fate led her to a more glamorous universe, that of cosmetics. She joined Chanel in Neuilly sur Seine. His challenge: to set up a sensory analysis laboratory in order to optimize the galenics of cosmetic formulas. In 2008, change of direction for the professional press as editorial director. At the same time, at the end of 2012, she created her consulting firm to assist companies in the development of cosmetic evaluation methods and scientific content writing. Finally, she teaches at ISIPCA on sustainable development modules, CSR, and the natural sector. It has collaborated with the Cosmetotheque® since its creation.